While having a child is often touted as the best time in a woman’s life, for many new mums – and new dads too – life takes a darker turn when a baby arrives. 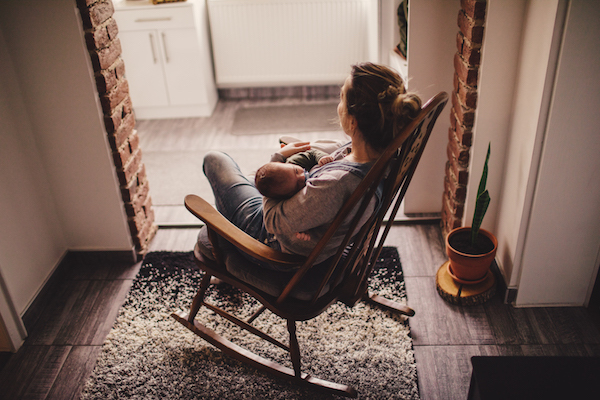 This disconnect between how society portrays new motherhood, and how many women actually feel means women have a whole range of complex feelings about what they are going through. They often judge and isolate themselves, and might feel worried about seeking support. For one, they may be deep in the trenches of surviving new parenthood, genuinely unable to make sense of what they’re experiencing. They may also feel embarrassed about feeling overwhelmed, anxious or depressed, believing that motherhood should come naturally and that they’re somehow at fault. This is simply NOT the case. “As a mum or dad it is easy to feel guilt and shame that can get in the way of seeking the help you need,” support agency PANDA confirms. So how do you know when you’ve reached a tipping point, and that you might need some extra help? Ideally, don’t wait until you reach a tipping point. All new parents are deserving of compassion and support and they don’t need to be at crisis point to take steps towards being better supported. If you’re finding yourself exhibiting any – or several – of the following then it’s time to chat to your partner, best friend, mum, sister, brother, GP or other health professional about making sure your needs are met – not just your baby’s needs. There’s no need to reach any sort of “tipping point” with these hard-to-bear feelings. Reach out now, because you deserve better. If your feelings are overwhelming you, sneaking in when you least expect them or simply dominating your day, it’s important that you don’t suffer in silence. Remember your needs and happiness count. Some extra support can help you to regulate these tricky feelings and give you a breather from the overwhelm. Anxiety can be incredibly debilitating, especially if you add a new baby to the mix. For some, anxiety may look more like anger – or perhaps an overwhelming state of fear or panic. Anxiety can be very hard to move out of when it hits, and frankly this is no way to live, Mama Bear. If you’re dealing with anxiety, anger or panic on a regular basis, you don’t have to put up with it. A trusted professional can help you with strategies to fight these scary adrenaline-sparking states. Perhaps you are feeling so out of sorts that seeing your friends or family seems too difficult, and small talk near impossible. Please know that other mums (and non-mums) have felt the very same way before you. You are not alone. Talking to someone you trust about why you feel safer at home alone is a great idea. If you don’t have a friend or family member, book into your GP for a longer consultation and write down some rough points detailing how you’ve been feeling. If you’re unable to chat to the doctor when you go in, at least you have some dot points to get the conversation started and take important next steps toward feeling more like yourself again. Sometimes, before we know it, we’ve retreated from the world in ways we hadn’t intended. This is a sign that you need some extra nurturing and kindness, and most certainly nothing to be embarrassed about. Talking to a trusted person or medical professional, saying something such as “I don’t feel like myself. It’s worrying me – and I need some help to get things back on track” is a great place to start. Feeling like you have not one iota of energy to do things that you used to find a breeze tells you that something is amiss and you should address it. Chat to your maternal child health nurse, GP or someone you feel close to about how tired and lacklustre you are feeling. Point them to this article and tell them you’re feeling pretty awful, and would like some help to feel at least a little better, with their assistance. If you’re not sure where to begin when it comes to professional advice and support, we’ve got you covered. Here are some good places to start. Think about who on this list you feel most comfortable talking to, and go from there. If any of these symptoms ring true for you, please know that the changes you are experiencing are treatable AND they’re signs that you need some looking after and support. Every parent should be compassionately supported as they learn to balance their child’s needs with their own. Taking that first step to reach out for some help – via a friend, GP or other support service – is a vital first step. You’re not alone. These are not signs of a crappy parent. And you deserve to have much, much better days. This is someone I know, how can I help? Reassure them that they are not alone. There are things that can be done to help. Suggest that they speak to their GP, other trusted health professional or PANDA. Phone PANDA for further guidance on how best to support them.